This week’s game release is going to be a little different. I was sorting through my hard drive and I found an old project of mine, Escape from Midnight Mansion. I’d like to share it with you. I graduated from San Francisco State University’s industrial design department (with a focus in digital media), and for my senior project, I decided to make a board game to help encourage cooperation in children. They’ve got a host of competitive board games, so why not throw some variety at them and maybe make a positive change in their lives? The basic concept is that you’re a group of kids locked in Midnight Mansion, and you need to get out before midnight. There’s a stack of face-down tiles with numbers and effects on them, and you lay them out, randomly generating the mansion as you explore it. 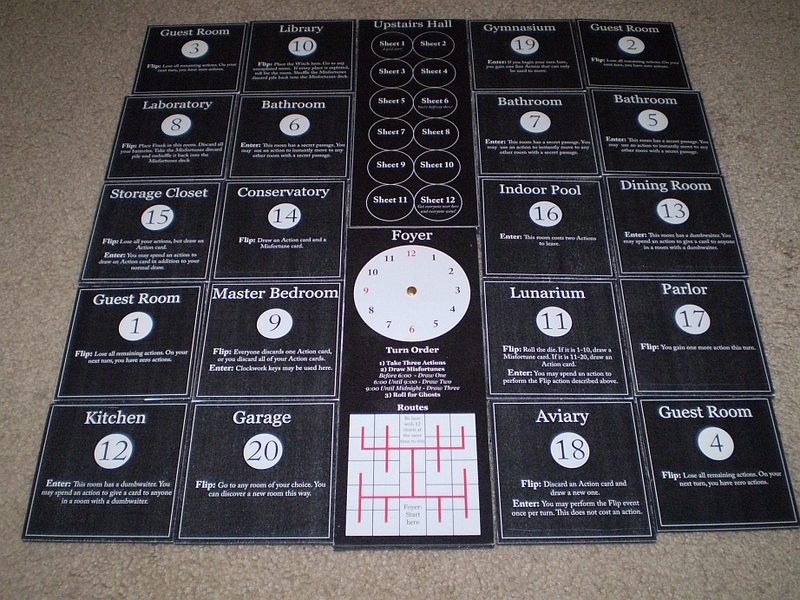 At the end of each turn, you roll a 20-sided die, and ghosts appear on the rooms with numbers that match the roll. The ghosts impede your progress, but if defeated, they vanish and provide bedsheet tokens. Collect enough bedsheets and you can create a rope and Escape From Midnight Mansion. At the start of the game, you won’t have too many rooms, so you’re less likely to run into ghosts. This is good because it leaves you with more options, but it also means you aren’t getting the resources you need. As time goes on, you’ll get more rooms and the ghosts will appear more frequently. Greater challenge, greater reward. It’s simple, but effect. 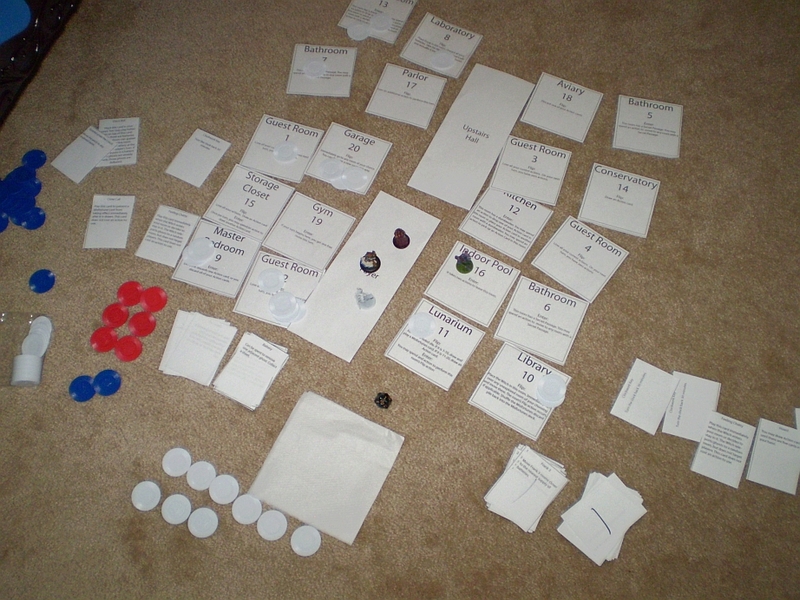 Here’s the game’s original prototype, printed out on paper. Here’s the game in its final form, printed in largely black and white in a nod to the horror films of the silent era, with red used to highlight important facets of the rules, such as valid paths and hours where the challenge ramps up. A quick turn summary has also been added to the components. The tiles were glued to foam core and cut apart. I managed to find a perfectly-sized shoebox to store all of the components. I’m amazed at how lucky I was that it all worked out. I just had to repaint it to match the theme, and it was good to go. Here are the game’s rules and other bits for print and play, along with some pictures. The folder contains the full report I made for the class, weighing in at a total of 123 pages. The rules and print-and-play assets begin on page 100. Someday, I’d like to revisit Escape from Midnight Mansion. It’s probably one of my proudest achievements, but it’s been about five years since I made it. I think I could improve on it, and I think looking back, there are lessons I’m still learning thinking back on the experience. As a designer, your job is to shape human experiences. You need to keep an eye out for design lessons everywhere. It can be hard to figure out what you can learn while waiting in line at the DMV, but there’s an easy source of design influence that many people overlook: Board games. I’ve seen a few people roll their eyes at the thought that tabletop games could teach them anything, but even if you don’t like to play board games, you can’t ignore them. Game design wasn’t invented after the transistor. Game design has existed alongside human civilization for thousands of years. If you take game design seriously at all, you need to at least consider sports and board games. Anyway, let’s talk about practical stuff. As a designer, you need to see a lot of different games. If you stick with video games, there’s only so much of the game that you, as the player, can see. In almost every case, there’ll be some part of the game that’s hidden away in the source code, like enemy AI or exactly how random numbers are weighted. Don’t get me wrong; you should still play as many video games as you can, but recognize that there are many layers of the game that you’ll never be able to peel back. This is not true of board games. Board games, by necessity, make all of the rules known to players. If you own a board game, you can see all of the rules. They’re all laid out for you in plain text. On top of that, board games don’t have the luxury of cutscenes or voiceovers. The art and the mechanics have to carry the the game’s themes. Love Letter is a card game with only 16 cards. It plays lightning-fast, so even if your friends aren’t normally into tabletop games, you can probably convince them to spend five minutes of their time. It’s seriously impressive what the game can achieve with so little. 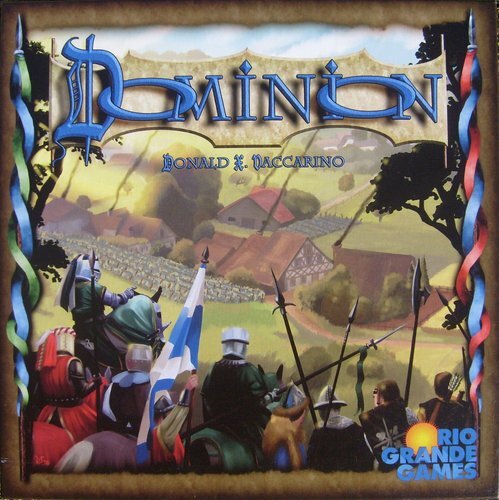 Dominion is a card game where you can earn cards to put in your deck during play. The goal is to end the game with the most Victory Point cards in your deck. However, those VP cards don’t do anything to help you otherwise, and if you load up on them, your hand is going to be full of cards that don’t do anything. It’s about developing an intuition for powerful card combinations and knowing when to push for victory. Poker really doesn’t need much of an introduction, but here’s the important stuff to pay attention to, design-wise: Poker is heavily dependent on luck, but it’s considered a sport, some players are clearly better than others, and there are actual tournaments with huge prize pools. If you want to take a good hard look at how random chance coexists with skill, look at Poker. Before you pull out the pitchforks, hear me out; Monopoly’s box says the game takes 60-90 minutes. Have you ever played a game of Monopoly that lasted 60-90 minutes? That’s because you’ve probably never played it as written. I could dedicate an entire post to this (and I probably will at some point in the future), but I’m just going to highlight a couple points. When you land on a space, you can either buy it for its listed price or auction it off. No money ever gets put on the Free Parking Space, ever. Think about what that does to the game’s length (remember: It ends when people get bankrupted), and you’ll start to scratch the surface of what the house rules variants do to the game. You know, I like these recommendations, and I think I’ll highlight more in the future.